I was listening to the radio yesterday, something I don’t usually do, addicted as I am to podcasts like “RadioLab” and “Welcome to Nightvale.” But a local talk show was on, and I left it on, because when I do listen to talk radio I make sure to listen to both conservative and liberal perspectives. I like to hear many sides of an issue as I ponder where I stand on it and how my decisions affect other people. Anyway, this local host was talking to her guest about abortion and she made a comment that I can’t get out of my head. She said that there is only one point in time when two humans occupy the same body – pregnancy – and that if we’ve made a decision that one of those humans is dispensable it’s because we’ve made a decision that one of those lives is more valuable than the other. Which is kind of a stumbling block to abortion when you’re of the mindset that all lives matter. Yes, I understand that her comments are rooted in the belief that an unborn baby is a human at the moment of conception vs. a bunch of cells that may one day become a human but aren’t yet. But there’s a fact about pregnancy that we all can agree on: at some point, two humans occupy the same body. If you think about it, it’s like something from a science fiction story. Baby, in the womb of the mother, growing, developing, feeding, moving, kicking the woman in the ribs until her chest is numb. And then one day, it escapes from its host in an explosion of blood and fluids, gasping its first breath before going on to live and thrive and generally forget the host that facilitated its life until it needs an advance on its allowance. But the magic! The miracle! A human inside of another human! A human, who will be born and become an intellectual, thinking, reasoning person, with ideas and thoughts and opinions, whose presence in the world will leave it changed forever, for better or worse. Even more amazing, we all grew inside the womb of another human. All of us! Me! You! One minute we were nothing, and the next we were human, and regardless of at what point in a pregnancy you believe that happened, it happened inside the body of another human. Have you ever thought about yourself in that way? Have you ever considered your own mother that way? Not just as the person who cooked and did laundry and told you to clean your room, but as a creature who literally allowed her body to be the incubator so you could eventually become you? I really don’t have a point to make in this post. I’ve just been musing, as I often do, on the miracle of pregnancy and the alien-like way we make our way into this world, when the rules of time and space are suspended, allowing two living beings to occupy the same space at the same time. Maybe I’m just giving you a chance to look at things from another perspective. I forgot to tell you that I posted my first post at the Paradise, Uganda blog. I actually posted it before my little musing the other day but it ironically touched on the same theme: being on the outside, looking in, and wondering why you’re there. For the record, what I originally thought I was volunteering to write is nothing like where my blog posts are going – and with the blessing of my dear friends. Rather than help with the fundraising “rah rah”, I’m writing more about faith and life and … well, stuff that’s where I’m most comfortable. Yay! When my friend Jesse Sprinkle asked me if I wanted to be involved in a project he was working on, I didn’t ask what it was or what he needed from me. There are moments in your life when someone asks and you say yes and you know it’s exactly as it should be. I’m not a musician. I’m not a missionary. I’m not a fundraiser or a world traveler. I’m not hip or cool or trendy. I’m just a writer. For years I’ve written feature articles in magazines and websites on everything from entertainment to dog food. I love telling stories. So when Jesse asked me to join the team for Paradise, Uganda, I signed on for the one task I knew how to do: blog. It’s never easy jumping into a project that’s already been moving along at mach speed. It’s difficult to find your place, to keep up, to feel part of the crowd. The things I’d originally planned to blog about … well, they just don’t seem like where I’m supposed to be. The ideas I had … someone else has them, too. The things I thought I brought to the table … not so helpful right now. It would be easy to just back out, just say, “Gee, I don’t think I’m supposed to be here, I think I made a mistake” and go home and hide under a rock because I don’t fit in. Twenty years ago today. I can't tell from this picture which chakra was out of balance. Maybe those poofy sleeves were holding me up. 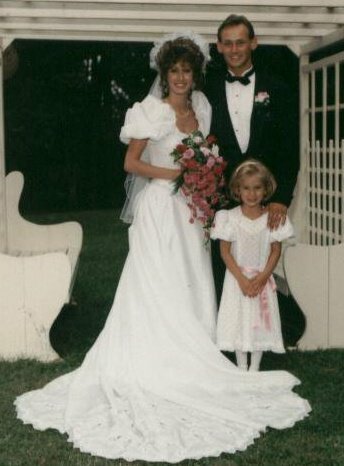 Today is my 20th wedding anniversary. Twenty years ago today, it was raining and I got my hair done, both things that happened today. Had we set up a dance floor in a field and partied under the stars with our family and friends it would have been a complete deja vu. This has been a very stressful few weeks for me, so when I sat down in the salon chair today and Scott introduced me to his personal assistant, and told her about how I’d been a customer for years, and did I remember that commercial I did for them, and on and on, it kind of pushed me over the edge. I think my emotional stress level was already at code red, and talking about a commercial I did for him about 10 years ago – when I was younger, thinner and way less gray – tipped the scale. Of course I freaked everyone out. Scott said we needed to stop and rebalance, so he sent his assistant Sara to get the chakra chart. He told me to, without thinking, point to two colors that I liked. I picked purple and orange. Then he had Sara gets some spray bottles. he sprayed a little of each near me and told me to pick the scent that I liked best. One was disgusting; but the other was actually really nice. Anyway, he said that I picked the color that corresponds to my “chakra 2” or the pleasure/lumbar center. As I approach 2011 and my self-proclaimed “year of adventure”, I’ve been feeling the last few days that perhaps my idea of adventure and God’s idea of adventure aren’t the same thing. What if, instead of going into the year with a plan to do things, I went into the year completey and utterly committed to serving God, to – as I wrote yesterday in my post “Going on the trip but missing the adventure” – living as if I truly believed what Jesus taught? How might that change my life? The world? Can I really know what God wants from me? I’ve been having a dilemma lately. Well, for a couple of years, if I can be honest. No, I’m not having a crisis of faith. If anything, I’m more concerned with being faithful, but as I read the Bible and desire to follow God’s plan for my life I end up more confused and floundering. I continue, however, to love the relationships I have with people in Christian music – artists, publicists, other writers. But I simply became overwhelmed with the avalanche of projects that cross my desk every week and quite frankly jaded with the commercialism of an industry that basically makes its money from God’s word.